Developing integrative decision-making underpinned by a diverse knowledge base is seen as essential to meet marine spatial planning’s (MSP) sustainable development aspirations. 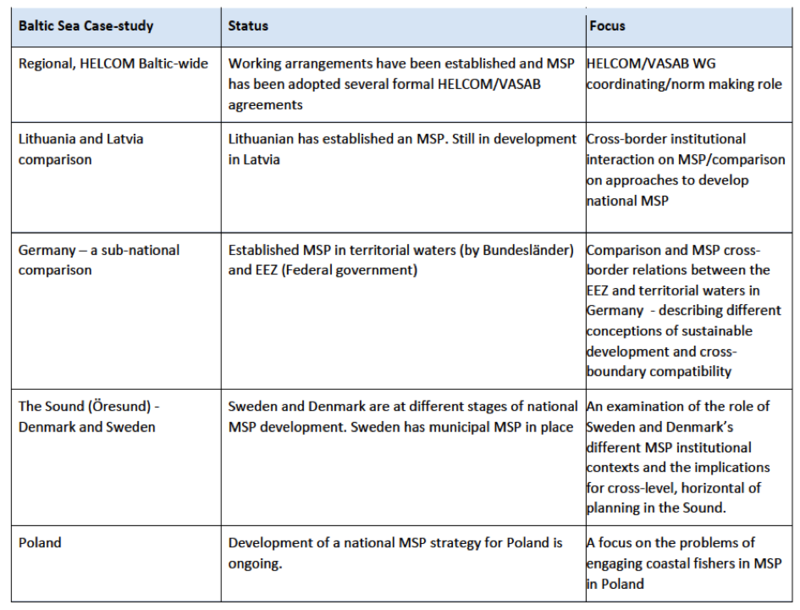 In contributing to a better understanding of how this might be achieved, this report considers knowledge integration challenges drawing on several MSP empirical cases across the Baltic Sea Region. What are the biggest challenges in integration knowledge cahllenges in the MSP process? How do countries cooperate transnationally concerning knowledge integration in MSP processes? How can subjective knowledge be integrated into the MSP processes? The MSP Directive has led to a widespread recognition of the need for a more systematic and integrated approach to the management of national as well as transnational marine areas. This approach includes resolving, or at least addressing in some way, different forms of fragmentation by developing integrative decision-making. A diverse knowledge base is seen to be at the core of mediating competing interests (stemming from different sectors of governments, business, and civil society) in marine environments. Knowledge integration implies here the ambition of mixing different types of knowledge to enhance understanding of the issue at stake. It may also result in shifting or at least affecting power relations and influence in decision-making. Present an analysis of the knowledge integration challenges arising in empirical work across several Baltic Sea countries, including Poland, Germany, Lithuania, Denmark, Sweden and Latvia. Explore how different MSP conceptions and empirical settings generate varying knowledge integration problems, with implications for MSP aspirations of achieving sustainable marine governance. Cross-border comparison of MSP between Lithuania and Latvia. Other affected actors, such as fishers, wind power entrepreneurs, NGOs (non-governmental organisations), municipality representatives and lower level experts and decision makers, among others (see Table). At the regional level HELCOM-VSAB established norms that emphasise natural science as the evidence-base to draw on in support of MSP. Attention is needed to ensure other types of scientific knowledge and other forms of knowledge are included in a way that improves the contextual relationship between scientific knowledge and the legitimacy of the MSP event or process. In cross-border MSP contexts, reaching agreement on norms early on about what constitutes data quality and data sharing may establish the institutional pre-conditions conducive to more effective knowledge integration. The Espoo Convention is likely to be limited in offering meaningful possibilities for stakeholder engagement, knowledge inclusion and influence in transnational MSP. The Ecosystem Based Approach (EBA) may offer the potential to integrate ecological and social knowledge (as shown in the Latvian case), but this should be done, if the social sustainability ambitions of MSP are to be addressed, through broad stakeholder engagement, rather than just drawing on narrow scientific and technical knowledge. There is a lack of understanding of the importance and treatment of the role of economic (incl. commercial) knowledge in MSP. More attention needs to be paid to how this form of knowledge at various scales influences and helps inform MSP decision-making in meeting sustainable development goals. While it is proving difficult to effectively incorporate fisheries in the Polish case, lessons from the German experience may be useful to draw on while keeping in mind the contextual differences between the two cases (which need to be further elaborated and distinguished). Taking a more nuanced and careful approach towards differentiating the ambitions, concerns and roles of different stakeholders (within the same sector, e.g., fisheries in Poland or different holders of socio-cultural values and knowledge) may provide openings for inclusion of different forms of representation and related knowledge in MSP. High degrees of knowledge integration may reflect a narrow knowledge base rather than effectively integrating different forms of data, information or knowledge. It may be beneficial to develop robust evaluative criteria to judge the sufficiency and quality of evidence bases (incl. the limits of science) in cases where hybrid knowledge processes may usefully supplement and feed into MSP decision-making. If knowledge contests are particularly contentious, third parties seen as neutral evaluators/mediators may be needed to moderate engagements, resolve conflicts and address uncertainties. Social science expertise should be drawn on in MSP to develop approaches to better support stakeholder engagement, particularly over controversial or conflictual matters in MSP. The point would be not to sensitise stakeholders to already decided upon goals, but to meaningful engage in robust mutual exchanges to help inform and set goals. Social science expertise may also help deal with the problems of engaging with socio-cultural issues, which may be more likely to explicitly involve knowledge and values dimensions. Institutional capacity building supporting social learning: takes time; requires institutional (and resource) investment and political will; necessitates a relatively wide recognition of stakeholders and their knowledge contributions; and requires that stakeholders are given a clear focus or purpose with some chance of influence. The German MV LEF, some aspects of the Sound and the Latvian cases show that, even if genuinely deliberative fora may not have yet been established in MSP, there are ways to engage with stakeholders that give possibilities for a broad array of actors to exchange views and different types of knowledges useful for MSP. Because of the detailed context of the case studies and the specific questions asked in the interviews, the transferability of the findings in quite low. However, in all MSP processes knowledge integration plays an important role. Therefore, other studies can build upon the methodology and used and can find inspiration in the findings presented.